Here is a list of often asked questions and answers. If you do not find an answer to your particular question, please contact us so that we can get you the right information. Q: DO I HAVE TO PURCHASE ANY EQUIPMENT OR SUPPLIES? A: No. 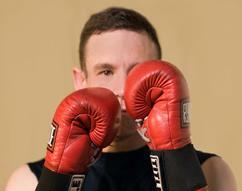 All boxing gloves, training equipment, and protective gear are provided in the gym. Even though everything is sterilized with alcohol between lessons, some students choose to purchase their own boxing gloves so that they don’t have to share with others. But the choice is always yours to make. Q: WILL BOXING HELP ME LOSE WEIGHT? A: Boxing is a great cardio exercise that will improve your health and energy, but boxing alone will not help you to lose a great number of pounds. What most boxing students notice is that the pounds “shift around” to better locations on the body. For instance, most male boxers will find that they lose a couple of inches around the waist, and that those inches move up to the chest for a larger chest. If your primary goal is to lose a great number of pounds, ask us about additional cardio workouts that you can do on non-boxing days. Q: WHAT CLOTHING SHOULD I WEAR TO A BOXING LESSON? A: Wear whatever clothing you’re comfortable in that also lets you do exercise movement. Most students train in gym shorts and t-shirts. Some students wear sweat pants. Your shoes should have an athletic rubber bottom (no dress shoes because leather bottoms are too slick). Most women prefer to wear a sports bra underneath their t-shirts. Remember that clothing selection is not about making a fashion statement or “hiding” a part of your body that you may feel self-conscious about. Nobody is going to judge you or your body! It’s all about learning boxing and having fun while doing it. Q: WILL I BE HIT IN THE HEAD? A: Most of our students have no intention of ever boxing or “sparring” with other boxers. Most students simply want to learn the basics of boxing for self-defense purposes and for a fun, enjoyable cardio workout. From time to time, all students are invited to a ”group session” where pairs of students do LIGHT sparring to test their skills against other boxers. But the choice is ALWAYS up to you. Nobody will ever force you to box other boxers. Q: I’VE HAD SURGERY; CAN I STILL LEARN BOXING? A: As long as your physician has given you the go-ahead, our customized training can adapt to the needs of anyone’s body. We have students who have had spine surgery, shoulder surgery, wrist surgery, and knee surgery. 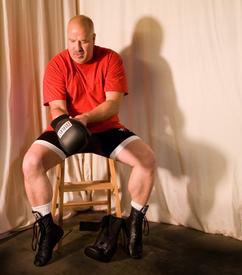 If you have physical limitations such as limited flexibility or restricted vision, you will be taught the boxing techniques that best suit you and your body’s limitations. Q: WILL ANYONE BE WATCHING ME AND CRITICIZING DURING MY LESSONS? A: The only two people in your part of the gym will be you and your instructor. Our job is to teach you boxing and to make sure that you’re enjoying the learning process! Q: CAN A FRIEND AND I ARRIVE TOGETHER AND SHARE A LESSON? A: Because our teaching techniques are so precisely tuned to your individual needs, it is very challenging to simultaneously teach these skills to two different people who may learn at different speeds and have different strengths and weaknesses. Lessons are generally private, with only you and the instructor together. Q: SOMETIMES I FEEL LIKE A SLOW LEARNER; WILL IT BE A PROBLEM IF I HAVE TO REPEAT A TECHNIQUE MANY TIMES BEFORE I HAVE IT? A: Your progress is not measured against any other student. There’s no timetable to follow. If you need to spend quite a bit of time to master a specific technique, we’ll work with you for as many minutes as necessary to ensure that you’re comfortable with the technique and performing it correctly. Q: AM I TOO OLD TO LEARN BOXING? A: Many of our students are in their 50’s. While a mature student will not quite have the speed and strength of a young student, it is possible for healthy adults of nearly any age to learn basic boxing. Q: I HAVEN’T EXERCISED IN YEARS; WILL THE LESSONS MOVE TOO FAST OR BE TOO CHALLENGING FOR ME? A: Your lessons start at whatever level YOU are at. You set the pace for energy and breathing. Nobody will push you faster or harder than you wish to go. Q: ARE THE BOXING INSTRUCTORS CERTIFIED? 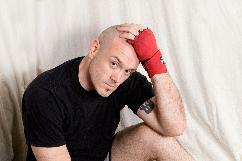 A: There is no organization in the United States that certifies boxing instructors. USA Boxing (which governs Olympic boxing and amateur boxing) certifies referees, judges, and tournament facilities, but USA Boxing has wisely decided not to become involved in certifying individual boxing instructors, since there are so many different teaching approaches. Q: DO I HAVE TO SIGN A CONTRACT OR MAKE A LONG-TERM COMMITMENT? A: Boxing lessons are pay-as-you-go. There is no contract to sign. Q: HOW MUCH DO BOXING LESSONS COST? A: The cost of a 45-minute private boxing lesson is generally far less than you would pay for a 45-minute “private gym trainer.” Please ask us about prices for the lesson frequency that meets your needs.